Got a Blake Street Bomber fan on your roster? 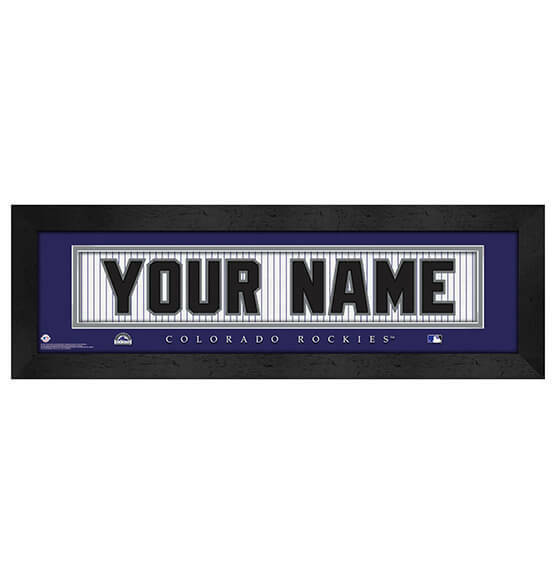 Our Colorado Rockies Personalized Nameplate is guaranteed to be a grand slam gift for any occasion. We make it easy to customize this fantastic framed MLB sports decor — just choose up to 12 characters for a made-to-order art piece that is created just for you! Designed to look like the back of a Colorado Rockies jersey, you will look like you are part of the team. With high-quality glass, a sleek black frame and vibrant colors, this item is sure to be a top-notch addition to any fan cave.